A campaign of coordinated non-violent direct actions to promote Indigenous rights and environmental protection in alliance with non-Indigenous supporters. A declaration, jointly released with Defenders of the Land in March 2013, where a network of Indigenous communities, leaders, and activists involved in high-profile struggles to defend their land rights, calls for a “Solidarity Spring” to precede a “Sovereignty Summer,” with actions on the International Day for the Elimination of Racial Discrimination on March 21, Earth Day on April 22, and through the summer. Indigenous communities have the right to determine the development on their traditional and treaty territories. In defending their right to say "No" to unwanted development, First Nations like Barriere Lake, KI, Grassy Narrows and many others are advancing alternatives that help us re-imagine our relationship to the environment. Across the country, people are increasingly supporting First Nations who are trying to protect lands, waters and air for everyone, and to win recognition of marine protections, of sustainable forestry, of local, just economies, and ofthe principle that we must respect the environment that we are a part of. We are calling on non-Indigenous people to join Indigenous communities in coordinated non-violent direct actions in the summer. Alternatives will only come to life if we escalate our actions, taking bold non-violent direct action that challenges the illegitimate power of corporations who dictate government policy. Over the past few months, Idle No More has ignited a spiritual fire in the hearts of Indigenous and non-Indigenous Peoples to come together to address issues related to: Honoring Treaties and Indigenous Sovereignty, Human Rights, Deepening Democracy reflecting a meaningful Nation to Nation relationship, and increasing Environmental Protections and protecting Mother Earth. In March, Idle No More joined forces with Defenders of the Land to launch a Declaration that calls on all People to participate in a campaign that was called “Solidarity Spring” and “Sovereignty Summer”. Idle No More and Defenders of the Land are now transitioning into Sovereignty Summer and people are calling for increased and escalated activities. The actions aim to bring attention to the Harper government agenda that undermines the rights of Indigenous Peoples, Canadian citizens, and the ongoing policies disrupting Indigenous peoples' lives - such as land claims, third party management, and no free and prior consent to development on Indigenous lands. We are in a critical time where lives, lands, waters and Creation are at-risk and they must be protected. The Harper government is moving quickly to pass the suite of legislation (C-45, C-428, S-2, S-6, S-8, S-212, C-27, and the First Nation Education Act) that undermines the treaties, our nation-to-nation relationship and Indigenous sovereignty, which is the last stand to protect our lands. Idle No More calls on non-Indigenous people to join Indigenous communities in coordinated non-violent direct actions in the summer. Alternatives will only come to life if we escalate our actions, taking bold non-violent direct action that challenges the illegitimate power of corporations who dictate government policy. People have been inspired to engage in creative activities of reclaiming, resurgence and resistance in exercising their Nationhood in ways they see appropriate for them. There has been a historic “Turtle Lodge Treaty” signing ceremony on Indigenous education, nations have reclaimed sacred spaces and peoples continue to protect their lands from invasion. There is a spiritual energy stirring and a large awakening is on the horizon as we transition to Sovereignty Summer. 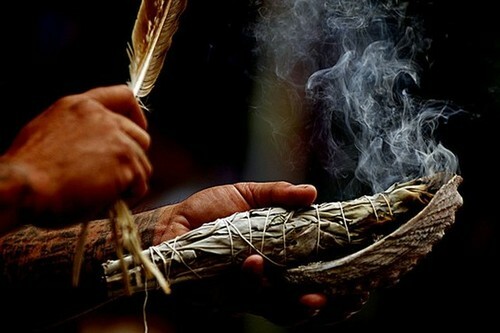 The spirit in which Idle No More began was through the resurgence of Indigenous laws and it is only appropriate for the resurgence of our spiritual and ceremonial practices - which are the foundation of our Nations - to guide us into this transitioning period. The time for Unity and Solidarity is NOW, our future generations are depending on us and asking us to come together to think about what we will leave for them. Leading into Sovereignty Summer, Idle No More calls on all people to join in a grassroots gathering for a Public Awareness Campaign in all Cities, Towns, Indigenous Communities and Villages across Canada and Internationally. An on-going gathering and occupation, starting on Saturday, May 25, 2013 at 5:00pm and continuing once a week, at the same time and at the same place as people/ groups see appropriate for them. As we move closer to summer, Nations/peoples/ groups may want to increase the frequency of their gatherings to each day of the week on a consistent basis. People can determine for themselves the appropriate location that has significance to them. For those in urban Centre’s this could be: prominent Government Buildings (Federal or Provincial) in Canada and at Canadian Embassies around the World. For those in their communities, this could be sacred sites, places of cultural importance and locations that are significant to people. To bring awareness to the public at large of the mission of the Idle No More Movement. To honor, fulfill and solidify Unity and Solidarity with all who support Idle No More in your community, city, town or village. This is not a onetime event but an ONGOING CAMPAIGN leading into Sovereignty Summer. Gather, Occupy, Rally and bring your songs, dancing, drums, signs, banner, flags and get to know and network with those who share your passion for the mission of the Idle No More Movement. Those events that wish to end with a March are encouraged to do so if your numbers permit. The inspiration for this Call to Action came from an Idle No More supporter in the Toronto region and other supporters asking for people to come together to take action to bring attention to the current Harper agenda and ongoing narrative of colonialism. With Idle No More only months old and the intensity of energy that lead the movement into the lives of millions worldwide from the tables of families to the tables of corporations...to the fingertips shared on social media to the lips of children, youth, and adults in classrooms...we sometimes get preoccupied with planning the next steps, creating and creating, to the next everything to create more awareness, knowledge, and empowerment; that sometimes we forget in our busy selfless days of Idle No More to show and share our gratitude. Therefore, this goes out to all those who are doing their part to support humanity and Mother Earth to heal, celebrate life, and honor each other...this goes out to the walkers, the water walkers, the fasters, the ceremonial holders, the pipe holders, the hunger strikers, the ones who are putting their lives on the line to create Change. #idlenomore Forever...its a Spirit and Lives! Life offers us the opportunity to become a Spiritual Warrior. of the Truth of their being. In our new Dream Time. Experimental Lakes Founder David Schindler Says Oliver and Redford Make Canadians "Look Like a Bunch of Absolute Idiots"
Once upon a time, in the beautiful land of Alberta there were magical machines that could turn sand into oil, that drew the toxins from the land and left the air and water clean and clear. It sounds like a fairy tale, but this is more or less what politicians like Premier Alison Redford and Environment Minister Joe Oliver are selling on their trips to Washington, according to scientist David Schindler. Instead of meeting with Aboriginal youth who had traveled 1,600 kilometres by foot in -50°C frigid winter temperatures to Parliament Hill, Prime Minister Harper went to an airport photo-op with two pandas. Inspired by the Idle No More movement, 17-year-old David Kawapit Jr. and six friends left their traditional territory to travel for two months through brush, snow and frigid winter temperatures - walking from northern Quebec to Ottawa to call attention to local issues facing youth, including suicide, and fight for the future of Aboriginal people in Canada. Sign the petition to PM Harper: It’s wrong to put PR stunts before people. Recognize First Nations rights and commit to equal education funding for Aboriginal children and youth. 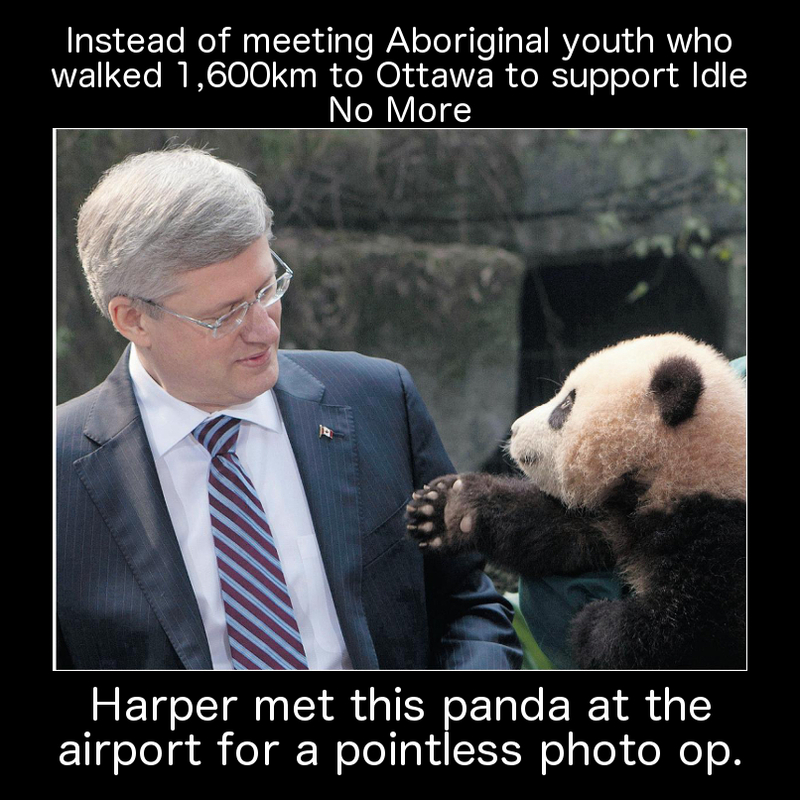 Canada’s Aboriginal youth face many hurdles -- and this panda PR shows you the problem with this government’s priorities. Young people shouldn’t have to walk 1,600km to get our government’s attention. Education funding for Aboriginal children and youth is a federal responsibility.We need our government to commit to a plan to reach equal education funding for Aboriginal children and youth in Canada. This is a moment to make sure Canadians know what’s going on, make our voices heard, and keep our promises. Please sign this urgent petition now and share it with your friends and networks. "Our people have more power than we know and understand. Harper is someone who understands power. This is a game of wills, and his acknowledgment of pandas over the Nishiyuu youth is intended to show that our people are powerless in the eyes of his regime. Little does he know leaders come and go but our people are forever. These youth showed the world the power of our people. Now it’s time to act." On January 18, 2013, the Hupacasath First Nation of British Columbia took the first steps toward challenging the Harper government’s new corporate rights pact with China through the Canada-China Foreign Investment Promotion and Protection Act (FIPPA). That’s the day the Hupacasath filed an application in court to stop the ratification of the FIPPA until the government has fulfilled its obligation to consult with First Nations about the impacts the treaty will have on their rights and their lands. No trade or investment deal in recent memory has attracted so much opposition in Canada – and for good reason. No investment treaty since North American Free Trade Agreement (NAFTA) poses a greater threat to the environment, public health, First Nations and basic notions of democracy. If the FIPPA is ratified, China-based corporations will be able to directly challenge local, provincial and federal policies that interfere with their “right” to make a profit from energy, mining or other controversial projects. Canadian firms will have the same “right” in China, which will have a direct impact on human rights and environmental protections in that country also. The Hupacasath First Nation is doing all of us a great service by challenging the FIPPA with China. Their legal battle will put Canada’s FIPPAs on trial and shine an important light on how trade and investment pacts undermine democracy in Canada and around the world. You and I need to help the Hupacasath however we can. ATTENTION: GET YOUR RESERVE TO GET INTERVENOR STATUS, IN SUPPORT OF FIPPA CHINA DEAL NOT GETTING RATIFIED. WE NEED MORE REPRESENTATION TO STOP THIS DEAL!!! For those who do not know, Brenda Sayers is the spokesperson for the Hupacasath First Nation of Port Alberni, B.C. The Hupacasath are a small First Nation of 280 people. On January 18, 2013, the Hupacasath filed in the Federal Court of Canada their Notice of an Intention to apply for an injunction against the federal government to prevent them from ratifying the Foreign Investment Promotion and Protection Agreement (FIPPA) with China. They have since filed the application. The basis of their application is that the government failed to honour its constitutionally mandated duty under section 35 of the Constitution Act to consult with First Nations peoples, the Métis and the Inuit when it negotiated ...the FIPPA with China. Several other organizations or Band Councils have also filed for Intervener status, which means they can file Affidavits in support of the Hupacasath. Brenda is the spokesperson for the Hupacasath regarding this application. She is very happy to hear of support for Hupacasath from Treaty 7 / Calgary people. The Band Council has retained a Vancouver law firm that specializes in Aboriginal Law, Underhill, Boies, Parker Law Corporation. Their address is: 440-355 Burrard St., Vancouver, B.C. V6C 2G8. The lead counsel is Mark Underhill. There is a case management meeting on Thursday, March 21, 2013 involving the Hupacasath legal team, lawyers for the feds and a Federal Court judge. Among other things, they will be deciding on dates for hearing the application. As I’d said, there are several groups or First Nation band councils seeking Intervener status. The federal lawyers are objecting. This is to be expected. The judge however will undoubtedly rule that the other FN band councils do have the right to be heard on this application as FIPPA affects their rights too. The date of the hearing could be as early as late April. The legal costs are estimated to be $75,000, which is why it is imperative to start fund-raising now. The Council of Canadians is raising funds through its site. There’s also a page available through Causes. Finally, anyone wishing to donate by cheque can do so by making it payable to, Underhill, Boies, Parker Law Corporation in Trust. The cost of around $150 is the fee for filing the intervenor paperwork with the federal court. The cost to put together an affidavit is much more and would be based on the lawyer's hourly billable rate, which is much more than $150 an hour. Since the issue is the same for all First Nations, Metis and Inuit, which is the failure of the federal government to discuss in a meaningful way the parts of FIPPA that affect First Nations/Metis/Inuit rights (by extension, the rights of all Canadians), it would make sense for various band councils that wanted to get intervenor status to join together and split costs for a single application as opposed to everyone doing their own thing. There are 1.6 million First Nation, Metis, and Inuit and if we all pull together and get intervenor status for FIPA China Deal and Omnibus Bills this increases are chances of winning in the courts. If band council wish not to get involved, speak with the elders and get a petition going and as long as it is a majority, this will be good enough to get an intervener status. In the works: YouTube Video and tryin to get Brian on APTN. He is in the process of getting us a lawyer for our use nation-wide: cheaper and more organized. Then we know on our side how many FN groups are in support of this application.